Rebuilding lives: Sister of Charity Christine Henry visiting a family from the bush as part of her role as co-ordinator of the Downs and West Community Support. TEN years ago Sister of Charity Christine Henry started a fundraising campaign for farmers crippled by the worst drought in a century. “A lot of people had to walk off their land. It was devastating,” Sr Henry, whose country and city supporters will come together next month to acknowledge the significant work of the Sisters of Charity in supporting rural communities, said. As the co-ordinator of the Downs and West Community Support, Sr Henry started serving farming communities across the Darling Downs, the Burnett, the Lockyer Valley and south-west Queensland. As a woman raised in the tiny Darling Downs community of Allora, she knew exactly what was needed – food hampers, petrol vouchers and support paying household bills. Sometimes volunteers were called in to help families with household cleaning and upkeep – a backyard blitz, mini renovations, a new front gate, furniture and even a new tyre for a tractor. All were gratefully received within farming communities which, after the 2007 drought, were hit by seasons of failed crops. 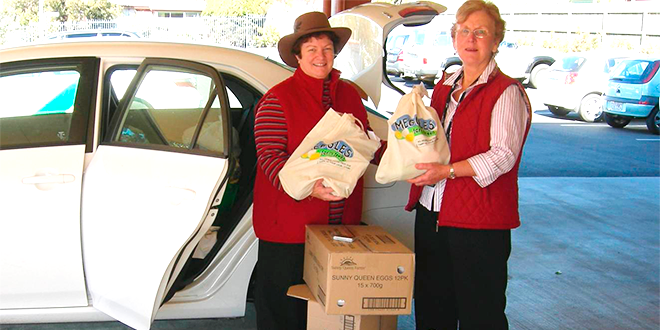 By 2009, Sr Henry, a registered nurse, could see the need was so great that the Sisters of Charity service needed to continue to provide household hampers and pastoral support. She witnessed farm communities collapsing and in dire need. She spent hours and days with families enduring their working stress and anxiety as livestock were culled and businesses failed. It was a time when the suicide rate rose amongst all ages, and particularly men. “The prolonged drought was the last straw for many. And then in 2011 and 2013 they were hit really badly by the floods,” Sr Henry said. She reached out for more donors and volunteers, and new and innovative ways to raise funds. She became a conduit between city and country – and support snowballed. Country life: Sr Christine Henry and her toy poodle, Lady Kenya. To city folk, Sr Henry has become known as the “Nun in the Bush” and the list of fundraising drives, workshops, camps and programs is impressive. “The first event we held was called a Country Girls’ Day Out, which then became known as Wellness Days for Country Women,” she said. Wellness Days are a chance for often-isolated country women to come together. Women’s health issues are given priority because so often the women are holding the families together, but their own needs are neglected. Wellness Days often include psychology and motivational talks and access to pap smears and mammograms, while massage and reflexology are offered. Generous household hampers and toiletry packs are given away as lucky-door prizes. 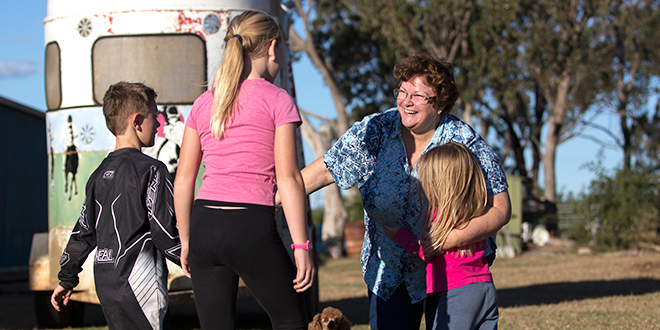 In the past decade, more than 5000 women have attended Wellness Days in 100 locations across the Downs, the Burnett and south-west Queensland. Five-thousand household hampers have been given away at an estimated value of more than $1 million. “Bugger the Drought”, focusing on men and families, is the name of another set of social events that has been organised by Downs and West Community Support. Sr Henry estimates she has driven a million kilometres during a decade of service through her pastoral work and visits. She drives a station wagon provided by St Vincent’s Health Australia, Queensland. A second vehicle, a decommissioned ambulance, allows her to transport and distribute food and furniture to isolated families. 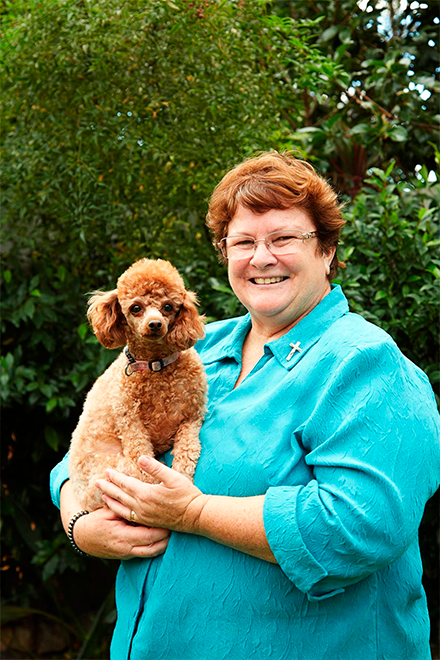 Often on her trips, Sr Henry is accompanied by a toy poodle named Kenya. “She’s an icebreaker,” she said. “If you meet someone for the first time they will notice Kenya before they notice me. Sr Henry, who completed her novitiate in Sydney in 1976, said she drew inspiration from the people she met – and that kept her mission alive. “(It’s) the love of the people and to see a smile on their face when we arrive,” she said. “Being able to give people an encouraging word or a hug means so much to them. Sr Henry said outback Queensland was undergoing massive change. “Since the prolonged drought and the floods the landscape has changed dramatically,” she said. “Rivers have changed their courses, small townships are like ghost towns. “The mines, coal seam gas, and climate change are having a dramatic impact on our land as well. Country and City supporters of Downs and West Community Support will gather to celebrate a decade of service at St Finbarr’s Hall, Betheden Tce, Ashgrove, on September 2, at 10.30am. Donors and volunteers, and those who organised fundraising events will be thanked and receive certificates to acknowledge their significant contribution. Donations to support farming communities in need can be made online by visiting www.downsandwestcommunitysupport.org. project: Downs and West Community Support volunteers offer a helping hand for people doing it tough in the bush.